Speculation about the possibility and scope of adverse down-ballot effects on the Republican side of the ticket in 2016 have peppered electoral prognostications ever since it became clear that Donald Trump would become the party’s presidential nominee earlier this spring. It is certainly still premature to suggest there will be such a measurable effect, and public polling has generally suggested many potentially vulnerable GOPers are remaining competitive despite having a controversial standard bearer at the top of the ticket. All the while, however, Democrats have seen a cycle in which the party was initially expected to shed multiple gubernatorial seats to an impending Election Day in which they might actually make gains – and perhaps do so in record-setting fashion. A Smart Politics analysis finds that if Democrats win 10 of the 12 states holding gubernatorial elections in 2016, the party will break its all-time record for the highest percentage of seats won in a cycle since its founding in 1828. At the moment, Republicans are heavily favored to win gubernatorial races in two of the 12 states holding elections in November (North Dakota and Utah) while Democratic nominees have an advantage in seven (Delaware, Missouri, Montana, North Carolina, Oregon, Washington, and West Virginia) and are in toss-up races in three others (Indiana, New Hampshire, and Vermont). Democrats would need to run the table in the 10 states outside of North Dakota and Utah to set the party’s all time best gubernatorial winning percentage at 83.3 percent for the cycle. For this analysis, Smart Politics examined 137 election cycles since 1828 in which at least five gubernatorial elections were conducted across the country. That tally includes 47 presidential election cycles, 47 midterms, and 42 cycles in odd-numbered years (all of these at least a century ago). [Note: During this span there were 52 additional cycles – all in odd-numbered years – during which there were fewer than five gubernatorial elections, cumulatively accounting for just 4.5 percent of the 2,900+ such contests conducted since 1828]. To date, Democrats have won at least 80 percent of gubernatorial elections in just three of these 137 cycles with the most recent taking place 84 years ago. In late 1932, the party set its current high water mark with victories in 29 of 35 races (82.9 percent) with Republicans winning just five states (Delaware, Kansas, New Hampshire, North Dakota, Vermont) and third parties winning one (Farmer Labor, in Minnesota). Democrats won the governorship in Arizona, Arkansas, Colorado, Connecticut, Florida, Georgia, Idaho, Illinois, Indiana, Iowa, Maine, Massachusetts, Michigan, Missouri, Montana, Nebraska, New Mexico, New York, North Carolina, Ohio, Rhode Island, South Dakota, Tennessee, Texas, Utah, Washington, West Virginia, Wisconsin, and Wyoming. [The party also won Louisiana earlier that spring]. Prior to 1932, it had been another eight decades since the nation had seen Democrats so thoroughly dominate in gubernatorial elections. In 1852, Democrats were victorious in 12 of 15 states (80.0 percent): Arkansas, Connecticut, Florida, Illinois, Indiana, Louisiana, Michigan, Missouri, New Hampshire, New York, North Carolina, and Rhode Island. The Whigs, who also lost the presidency that cycle to Franklin Pierce, won only Maine, Massachusetts, and Vermont. One year later in 1853, Democrats won gubernatorial races in 13 of 16 states (81.3 percent): Alabama, California, Connecticut, Maryland, Mississippi, New Hampshire, New Jersey, Ohio, Rhode Island, Tennessee, Texas, Wisconsin, and Vermont. Whigs won Maine and Massachusetts while Herschel Johnson carried Georgia under the States’ Rights Party banner. Democrats won more than three-quarters of gubernatorial elections in four other cycles: 1850 (10 of 13, 76.9 percent), 1936 (27 of 34, 79.4 percent), 1958 (26 of 34, 76.5 percent), and 1974 (27 of 35, 77.1 percent). In 2016, Democrats have a chance – if all the cards fall their way – to best their 1932 mark by winning 10 of 12 races (83.3 percent). As mentioned above, there are two states firmly in the GOP camp: Gary Herbert of Utah is slated to enjoy a large double-digit win over Mike Weinholtz and businessman Doug Burgum is heavily favored to win North Dakota’s open seat race against State Representative Marvin Nelson. Can Democrats run the table in the 10 remaining states? The party is strongly positioned to hold seats in Delaware (an open seat race with nominee U.S. Representative John Carney), in Oregon’s special election (with Governor Kate Brown), and Washington (with Governor Jay Inslee). Republicans have lost each of the last eight gubernatorial races in Washington since 1984 and Oregon since 1986 – the party’s longest droughts in the nation – as well as six in a row in Delaware since 1992 (tied for its third longest). Democrats are also favored in three states where Trump is expected to cruise to victory at the top of the ticket. In Missouri, Attorney General Chris Koster (+11.0-point Real Clear Politics advantage) did not have to spend much money during his drama-free nomination campaign whereas businessman Eric Greitens had to navigate the most divided GOP gubernatorial primary field in state history. That has helped Koster build an advantage in a state where Democrats have won five of the last six gubernatorial races. Democrats are looking for their fourth consecutive gubernatorial win in Montana where Governor Steve Bullock is favored, but may need a little assistance from the Libertarian nominee (Ted Dunlap) as he did in 2012 when the vote for Libertarian Ronald Vandevender was nearly 2.5 times that of Bullock’s victory margin over Republican Congressman Rick Hill. Bullock is hoping his eight years of statewide elected office propels him over the finish line against political novice, engineer, and business executive Greg Gianforte. In West Virginia, all of the x’s and o’s seemingly favor Republicans in a state where the Democratic Party has been decimated in presidential and legislative races in recent cycles due in part to Barack Obama’s very low favorability rating in the state. However, billionaire Jim Justice appears to be another in a long line of Democrats who is just the right fit to win a West Virginia statewide race. Justice has led State Senator Bill Cole in sparse polling of the race conducted since the summer. Democrats have won the last five gubernatorial races in the state since 1996 – its fifth longest winning streak in the nation. A seventh state where Democrats are well situated to win – and one of just two pick-up opportunities the party has this cycle – is not a shoo-in for Trump: North Carolina. Since July, Attorney General Roy Cooper (+5.4-point Real Clear Politics advantage) has led in more than three times as many polls as Republican Governor Pat McCrory, although all in single digits. Controversial state policies that have seen business leave the Tar Heel State and an underwater approval rating for McCrory will enable Cooper to run far enough ahead of Clinton such that a victory by Trump could still see an unseating of the governor. That leaves three competitive matchups that would all have to fall the Democrats’ way for the party to notch its best ever cycle in gubernatorial elections. In Vermont, there has been scant public polling of the race between former Democratic state legislator and state transportation commissioner Sue Minter and Lieutenant Governor Phil Scott. A close race is expected with Minter hoping to capitalize on big victories by Hillary Clinton at the top of the ticket as well as popular U.S. Senator Pat Leahy. In New Hampshire, Democrats knew they would take a hit when Governor Maggie Hassan decided to run for U.S. Senate. Republican Chris Sununu has held a narrow lead over fellow Executive Councilor Colin Van Ostern in initial polls conducted after their respective mid-September primary victories. Democrats have won the last six Granite State gubernatorial contests since 2004. In Indiana, it’s unclear whether former Democratic state house speaker (and 2012 nominee) John Gregg benefited from Governor Mike Pence’s 11th hour exit from the race to run on Trump’s ticket or whether Pence was a more vulnerable opponent than his replacement, Lieutenant Governor Eric Holcomb. A non-trivial amount of votes will also go to Libertarian Rex Bell, as the Hoosier State has one of the strongest state Libertarian parties in the country. In the end, the odds are that Democrats will probably lose at least one of these 10 contests – barring an epic Trump collapse or stronger than anticipated down ballot effects of his candidacy. But, if Democrats manage to beat those odds, the accomplishment will be particularly noteworthy coming off the 2014 cycle when the party tied its worst mark in gubernatorial elections in nearly a century, winning just 11 of 36 races, or 30.6 percent (numbers also reached in 1994 and 1998). 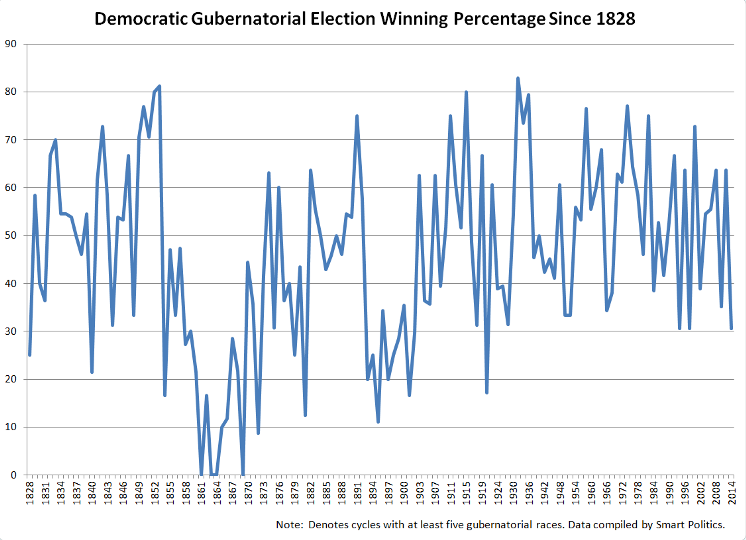 The last time Democrats performed worse in races for governor was in 1920 when the party won just six of 35 contests (17.1 percent). Previous: Will Democrats Sweep the Northeast Yet Again? 1 Comment on "Democrats Could Notch Best Gubernatorial Election Cycle in Party History"
2. VT: Senator Sanders does not seem to care about this not insignificant state contest – in contrast to the election for lieutenant governor. Moreover, 1960 was the most recent occasion in which a governor of one party (Bob Stafford) was succeeded by a person of the same party (Frank Ray Keyser, junior).